Location and how to get there: 12 Fourth Street, at the corner of Market in San Francisco’s dynamic SOMA neighborhood. Hotel Palomar is located around the corner from the new Westfield San Francisco Centre, featuring the West Coast’s first Bloomingdale’s, Union Square, the Moscone Convention Center, financial district and other attractions. From the airport you can either take a shuttle, taxi or the BART (train). Number of rooms: 192 guest rooms. All rooms include; complimentary wireless and high speed Internet access, multi-line phones including a cordless, voicemail and speakerphone, two plush bathrobes, TV with on-demand movies, Nintendo and DVD player, honor bar with specialty and gourmet items, complimentary daily newspaper, morning coffee and tea in the lobby, in-room safe, iron and board, hairdryer and a companion goldfish delivered to your room for the duration of your stay upon request. Price range: $229 to $369 USD per night. Time of year to go: Any, this hotel is perfection year round! Hotel Palomar is an artful, urban retreat in the heart of downtown San Francisco. Hidden five floors above the city’s hustle and bustle and just steps away from the active San Francisco Union Square, the hotel, a Kimpton Hotel, is like a great painting waiting to be discovered. The style of this San Francisco luxury hotel is contemporary, but not trendy, with playful touches throughout. Hotel Palomar is centrally located and is just a short walk from Moscone Convention Center and great art museums, such as SF MOMA, as well as the beautiful Yerba Buena Gardens, perfect for relaxing and enjoying the sights. Services: Concierge, room service, high-speed and wireless Internet, complimentary daily newspaper, in-room yoga basket & video (upon request), organic coffee served every morning in the lobby, overnight shoe shine, pet patrons can inquire about special services from Hotel Palomar’s own Canine Concierge. Hotel Restaurants & Bars: Highly regarded by many as the best San Francisco French restaurant, Fifth Floor Restaurant is quite literally on the fifth floor of Hotel Palomar. Oozing with elegance, Fifth Floor’s rich dining room is both hip and classic, a carefully-designed state of grace, befitting this Union Square restaurant. For 2007 Fifth Floor was awarded 1 Star by the prestige Michelin Guide. The guide acknowledges the décor, location & food all complimenting the wait staff with their “flawless formal service.” The guide also highlights Sommelier Emily Wines “to help you choose among the 1,400 bottles on the award winning list.” Outside the Fifth Floor is Lounge on Five, an inviting lounge where guests enjoy specialty cocktails and the restaurant’s inspiring wines. Sophisticated and sublime, Lounge on Five is a comfortable hideaway for after work, after dinner, or after a night on the town. Spa, health club: In-room spa services are available and arranged through the concierge, there is also an on-site fitness center, with cardio, core, weight and endurance training equipment. Bath products in rooms: L’Occitane bath products- lovely! 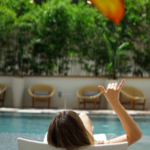 Specials for women/girlfriends: Wellness Weekends Package: Kimpton Hotels and body + soul magazine invite you to relax and recharge your mind and body with Wellness Weekends at properties nationwide. Wellness Weekends are available in ten cities, offering guests special amenities and discounts on signature Kimpton spa experiences, guaranteed to maintain health and harmony while on the road. Wellness Weekends Package includes: Deluxe, peaceful accommodations Welcome Detox Mocktail (a non-alcoholic pomegranate juice spritzer), Take-home aromatherapy scented eye mask, Use of in-room yoga bag, Take-home copy of body + soul Magazine and Guide to Balanced Living booklet A healthy breakfast, in-room, or at the Fifth Floor restaurant with take-home recipe sheet. Opportunity to book a signature Kimpton Relax & Rejuvenate in-room spa experience with a 10% discount off regular price Rates starting at $239 USD.